There's no need to wait for long lines when it comes to your Social Security Services loan needs. There are ways to find loan related information including eligibility, loan status, and payments online. Simply follow the easy steps below to do so. Step 1. Type https://www.sss.gov.ph on your browser. As I've mentioned in the previous posts, make sure nothing is missing in the URL underlined. Otherwise, you may be redirected to a different site. In Chrome, a warning will appear. 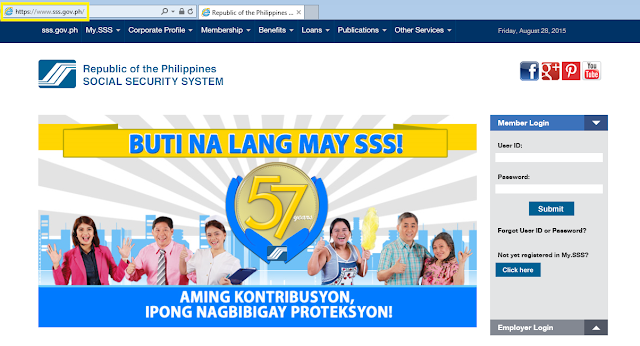 Prior to accessing the SSS website online, you need to register which should merit another post. If you already have an account, read on. Step 2. Login. If tabs are not displaying properly, switch browsers. 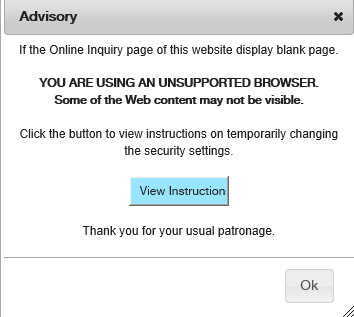 An advisory will popup on the screen advising you to use Internet Explorer. Upon logging in, click on the E-Services tab and click on the Apply for Salary Loan button. You will immediately know whether or not you are eligible to apply. In my case, I applied for the SSS Loan Condonation in 2012; hence, I cannot apply until the end date of the condonation. I also checked my husband's and his page returned a different response. Since he still has an existing loan that's not fully paid yet, he is also not eligible to apply until he has paid at least half of the loan. Other than the option above, you can also check loan eligibility by choosing the Inquiry option from the E-Services tab at the home page and then the Eligibility drop down list. 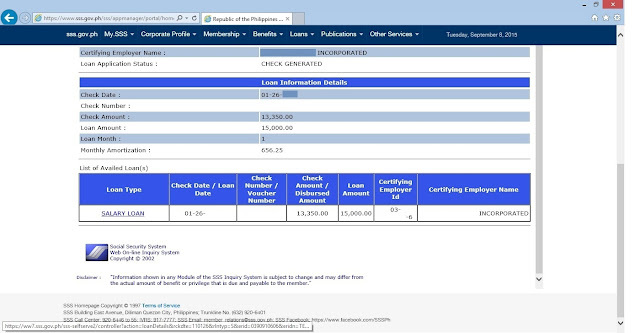 From this drop down list, you can be able to check loan eligibility (salary loan) as well as DDR - Funeral and Sickness or Maternity benefits. 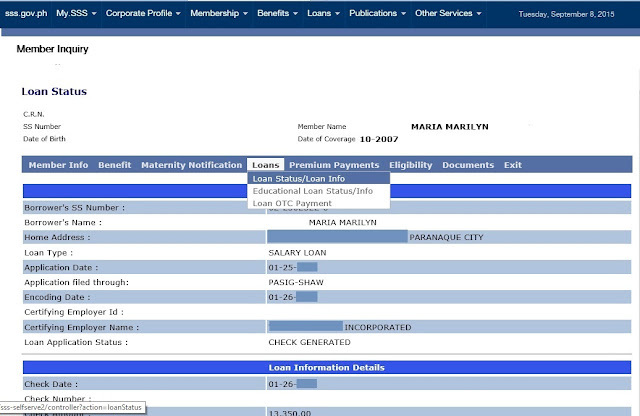 Loan status, payments and other information can be checked through the Loans tab. This page will display the status of your application. 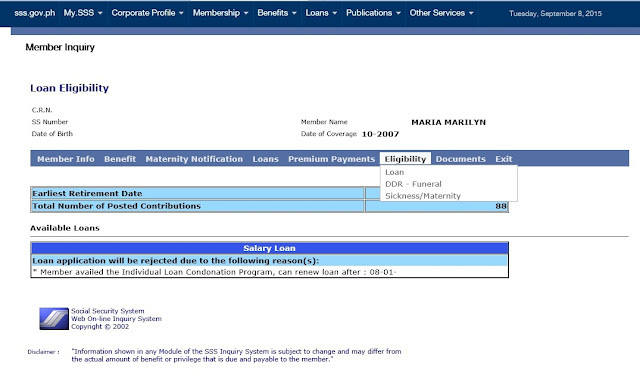 When my husband applied for his second loan, we checked this page regularly for the status. Once a loan is approved, you will be instructed to pick up the check at your current employer's office (human resources or auditing). If you'd like to double check payments made (in case you applied for a salary loan through your company), there is also an option to do that online. 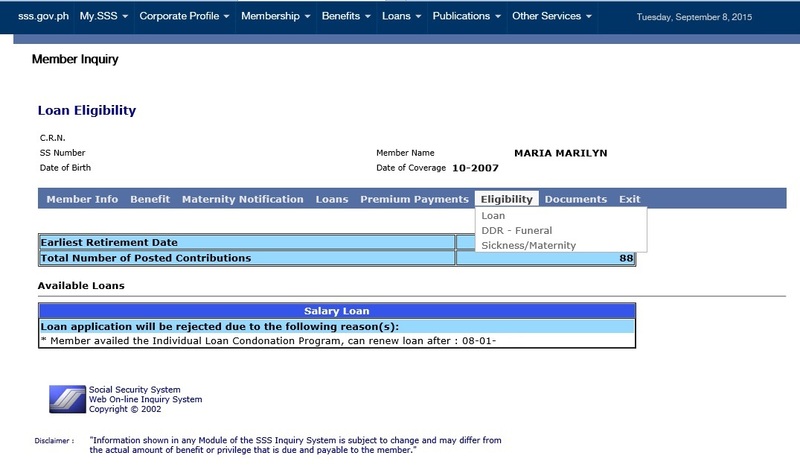 After clicking on the Loan Status tab, scroll down to where the Salary Loan is displayed. See image above. If you have multiple loans (both paid or unpaid), all of which will show up in the page above; so choose which loan you'd like to verify payments for. 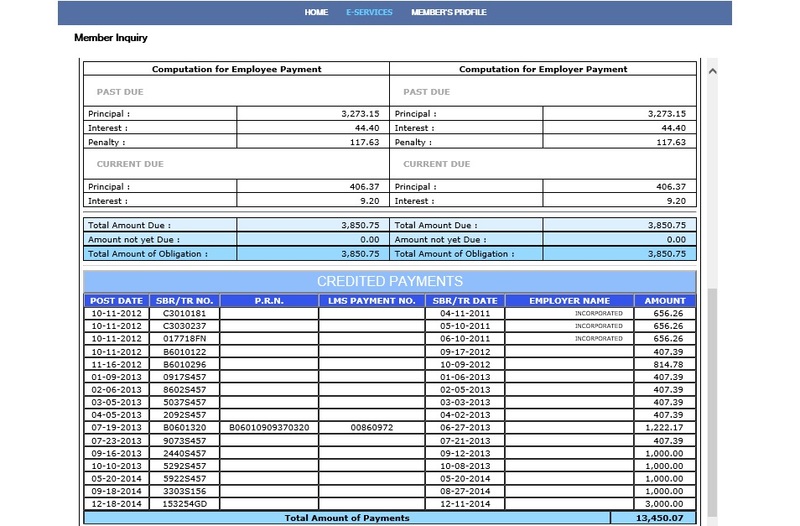 Next, click on Statement of Account & Loan Payments as highlighted below. The details of the payment will be displayed including the principal amount, interest, penalty, and all credited payments. In case you've resigned from a certain employer and there are pending SSS loan payments unpaid, your old company will no longer pay for it. In the past, it is often deducted from the back pay (or last pay). But today, it will now be your responsibility to pay for it on your own. In which case, you can pay through an SSS branch or authorized payment centers like SM Business Services. SSS offices can accept payments for several months but payment centers can only process one month's fee. Make sure not to neglect payments because this will prevent you from availing of loan again. It will also affect your monthly pension plan during retirement or even the lump sum. I know of a family who only got a measly amount from their deceased father's SSS lump sum because of an unpaid loan in the 80's which accumulated interest. The payment for that loan (including interest and other fees) was deducted from the lump sum. For more loan related information, you can always contact SSS at their website or Facebook page. In step 1, shouldn't it be .gov rather than .com ? You are right. Let me edit that. Thanks! pano po pag voluntary?pano malalaman kung approved na ung salary loan?thanks! Kung nag-apply ka na po, follow na lang kung saang office ka nag-apply (in my opinion). 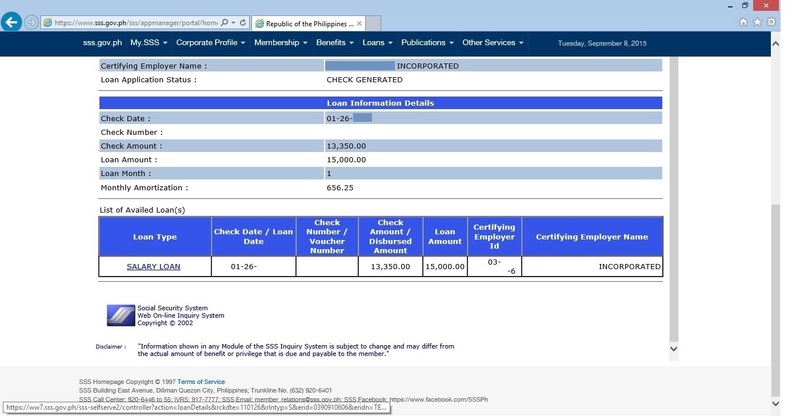 pano po ba malalaman kung naapproved na yung salary loan application thru online?. 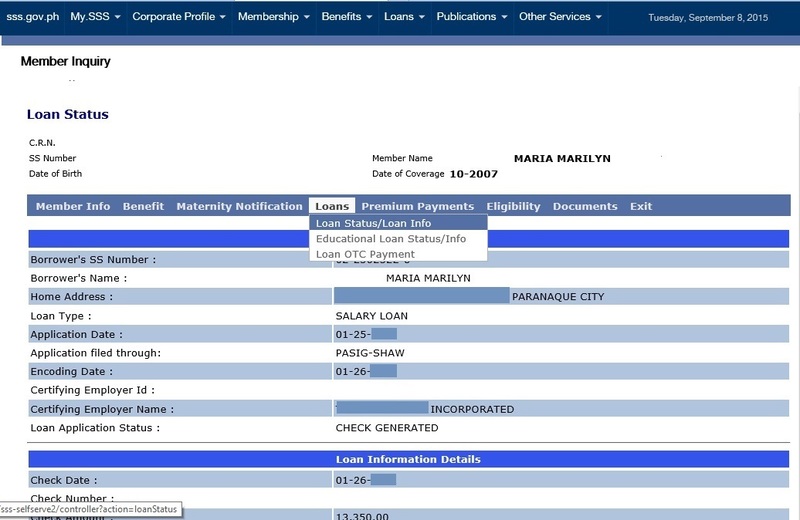 nag-apply ako thru online (salary loan).. pano malalaman if na-approved? Try mo po mag-send ng email via member_relations@sss.gov.ph or contact them through Facebook, https://www.facebook.com/SSSPh .